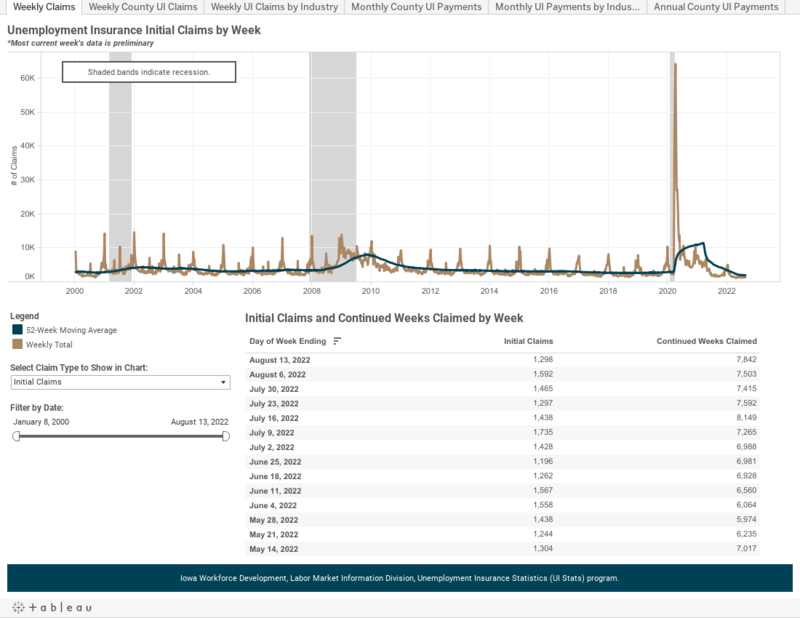 Unemployment insurance (UI) statistics are used for federal workload reporting; determining triggers for extended benefits programs; describing the size and scope of the UI program on local economies; and as an economic indicator. Unemployment insurance trust fund statistics, trust fund solvency analysis and employer contribution statistics are also provided. Data tables from the Iowa Unemployment Compensation Fund Status Report can be viewed by selecting a table title from the drop-down menu below. Each selection links to Data.Iowa.Gov. UI data can be explored through the following Tableau visualization. Filters can be applied to the charts and tables through the drop-down menu within the visualization. Sorting can be done by clicking the icon which appears in the column headings when the cursor is hovered above them. The data for each table can also be accessed through the links provided in the drop-down menu directly below.